IT WOULD have been a tragedy had the UPND won the last general elections because the kind of vengeance and retribution its leadership had planned would have completely dismembered the country, Edwin Lifwekelo has revealed. And Mr Lifwekelo said the clique of Guy Scott, Miles Sampa, Geoffrey Bwalya Mwamba, Mulenga Sata and Nevers Mumba largely contributed to the defeat that Hakainde Hichilema suffered at the hands of President Edgar Lungu. Mr Lifwekelo who is former UPND deputy spokesperson said Zambia was safer in the hands of President Lungu and that had the UPND won, the country could have gone through the worst forms of political victimisation and economic tribulations. Breaking his silence in an exclusive interview after resigning from the UPND to re-join the Patriotic Front (PF), Mr Lifwekelo said Zambians had made the best decision to re-elect President Edgar Lungu and that he was happy to have come back to the party he helped found. 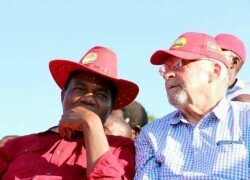 He said the UPND leadership was ‘‘gravely bitter’’ that they had yet again been rejected by Zambians and that he was aware more than two years ago that the UPND was never going to win the general elections. He said time had come for him to rejoin the party he belonged to and that on more than two occasions, former president Michael Sata had invited him but had refused because he was waiting for the right time. Mr Lifwekelo said most of the senior and ordinary members were not happy with the manner the UPND was being administered. He said it was not a secret that the general membership had strongly resisted the nomination of Mr Mwamba as Mr Hichilema’s running mate because of the uncouth behaviour of the UPND vice-president and his vulgar and vile language against citizens. Mr Lifwekelo explained that while he greatly appreciated that Mr Hichilema had given him an opportunity to serve the UPND as deputy spokesperson, he did not agree with his style of governing the party. Mr Lifwekelo said Mr Hichilema and Mr Mwamba had invested a lot in politics and that their desire to be in government was to recover their money and continue building their financial empires at the expense of the country and its citizens. “I have just gone back home where I belong as a prodigal son. Late President Sata invited me more than twice to work with him but I told him let me be the other side. I have been interacting with President Lungu who had also called me and wondered why I did not want to be in the party I helped to form. ‘‘Records are there that the PF was registered in my name and I just want to work with President Lungu. Zambia is safer in the hands of President Lungu and had the UPND won the last general elections, we would have seen the real Armageddon but thank God Zambians voted for President Lungu and the PF,” Mr Lifwekelo said. Mr Lifwekelo revealed that many people in the UPND were only waiting for the outcome of the petition by Mr Hichilema and Mr Mwamba who have rejected the re-election of President Lungu and have asked the Constitutional Court to nullify the presidential results. He reiterated his earlier statement that there shall be mass defections from the UPND after the Concourt petition as many members were tired of being perpetually in the opposition. Mr Lifwekelo appealed to the people of Southern, Western and North-Western provinces to reflect deeply because Zambia was much bigger than the three regions. He said he was disappointed with UPND general secretary Stephen Katuka who claimed he (Lifwekelo) had resigned because of poverty. Mr Lifwekelo said he had been in the UPND since 2011 and had endured the hardships associated with citizens who belong to the opposition and only moved on principle. “The UPND has received many members from the PF such as Guy Scott, Miles Sampa, GBM and Mulenga Sata and no one condemned them. Why should the UPND condemn me and call me names for my personal decision. They did not invite me as I joined the UPND at my own volition and I have left on my own volition,” Mr Lifwekelo said.